DOPE Black Cherry THC e-Liquid is made using premium Supercritical Co2 extraction. 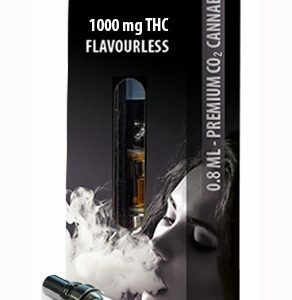 This ensures your DOPE THC e-Liquid is of the highest quality available in Canada. This THC e-Liquid is Dope! DOPE Black Cherry THC e-Liquid is made using premium Supercritical Co2 extraction. 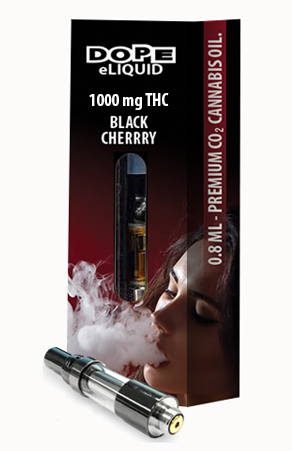 This ensures your DOPE Black Cherry THC e-Liquid is of the highest quality available in Canada. DOPE THC e-Liquid is made by blending our supercritical Co2 THC extraction with the perfect amount of premium pharmaceutical grade Vegetable Glycerin and Propylene Glycol. This proprietary blend gives you the perfect vape again and again. DOPE THC cartridges work in almost all vaporizer batteries with a 510 screw thread. If you do not have a vaporizer battery with a 510 screw thread, consider the DOPE Black Cherry THC Starter Kit which includes a THC e-Liquid cartridge, battery with a 510 screw thread, and a USB battery charger. This kit has everything you need to start enjoying this DOPE e-Liquid. This is a 0.8 ml THC e-Liquid cartridge. With 1000 mg of THC per ml, DOPE THC e-Liquid is considered the most potent vape juice available. Fantastic flavouring, a seriously good tasting thc eliquid. The high was instantaneous, invigorating and just tasted so good! A+!! Everything about purchasing the cartridge was delightful, and when the cartridge arrived…I was BLOWN AWAY!! Wow, intense, immediate high! Flavours super as well! For the price, this is the best THC eliquid I have come across. Other pens have 500mg of THC while dope has 1000mg. Think I know which one Im picking out of those two options!!! In my haste, I accidentally purchased the black cherry flavour over the intended blueberry I was looking at. Actually kind of glad I made that mix up! I wouldn’t have given the flavour black cherry even a second thought before, but now that Ive tried it I am hooked!! Its indeed a bold flavour choice that transfers over amazingly. – Would suggest! No joke, if I could give ten stars, I’d give ten stars. I’ve tried countless other thc pens, flyte and toko mainly. And both don’t compare to dope. Superior quality with a fabulous price. – Unbeatable. Instant mellow high with an awesome flavour! This Black Cherry makes me happy! Happy as a clam! You can’t beat the price either! Great flavour and takes you where you want to be, It doesn’t take much! Cavi Cones; What Are They?